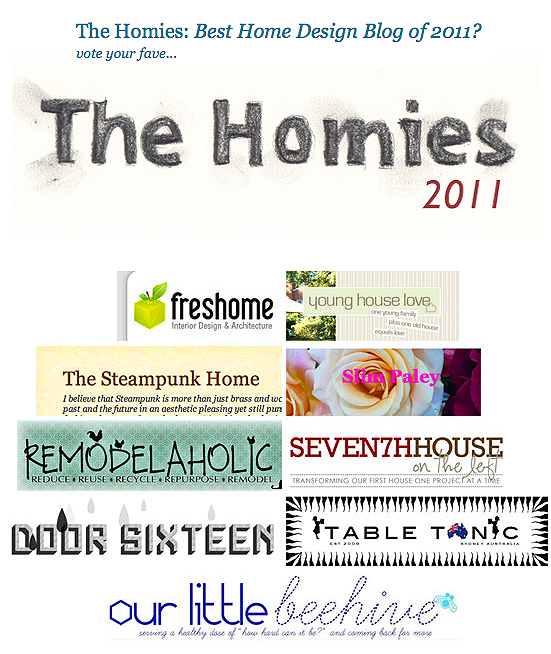 Table Tonic made the 2011 Homies finalists!!!!!! Oh. My. GIDDY AUNT! This very blog just made the finalists in The 2011 Apartment Therapy Homie Awards! 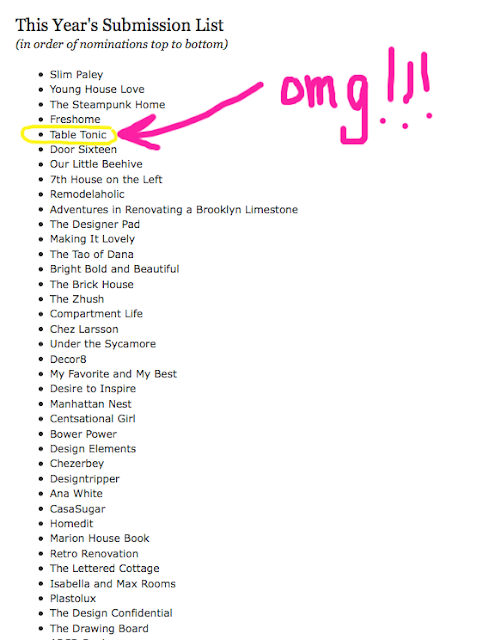 (There are not enough exclamation marks in existence for this proud moment!). Thank you SO MUCH to all who voted for Table Tonic. I am the happiest blogger alive right now! (above) When I first clicked on the Homies page and saw this I thought "Oh that's nice, they've used my logo to promote the Homies. Cool". That's because you're a finalist you fool! WAAHOOOOO!! You have my vote!!! Done & Done! I hope you win! YIPPPEEEE!! SO happy for you, Louise! Well deserved...you inspire me all the time so I am glad you're being recognized for it! bahaaaa love the instructions to click! Success is so much fun. Oh ok then :) Congratulations Louise...it's no surprise - your blog is stupendous! Hugest congratulations Louise!!! You have done a sensational job with Table Tonic. I'd really love to see you win this. 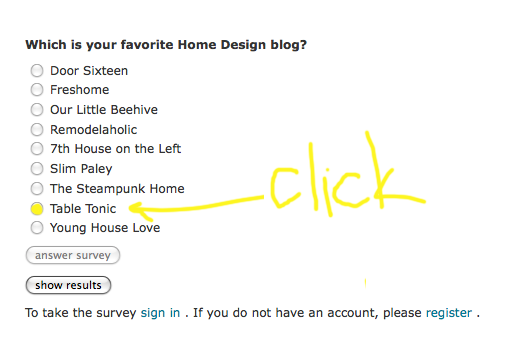 Easy to vote as you genuinely are my favourite "Home Design" blog. Thank for all the fab posts and good luck. Annie x.
wooo hoo Louise, fab news!!! Congratulations! WOOT! So exciting to see you're getting the recognition you deserve - Congratulations and all the best for the next stages! um O.MF.G! that is awweeesome! AT is like the blog of all blogs! Infact i think it was the first one i ever discovered! Im off to vote! Congrats. Going to vote now. Done... Congrats that is very cool. Congratulations - you deserve it, already voted! C O N G R A T Z G I R L !